THERE may be a new Scottish kid on the block on the other side of the Atlantic, but our trailblazer in Uncle Sam’s land still has star quality and is not finished earning his stripes. Martin Laird, a three-times PGA Tour winner, has seen his recent efforts on the US circuit overshadowed by compatriot Russell Knox. As high as 21st in the world rankings after winning the Arnold Palmer Invitational in 2011, Laird is now 150th. In contrast, Knox is on the up, having climbed 23 spots this year alone to sit 77th, not far behind Stephen Gallacher (64th) and Marc Warren (65th). On the back of three top 10s, including a brace of third-place finishes, Knox is occupying 34th position in this season’s FedEx Cup. With Laird 67th, he has returned home for the Aberdeen Asset Management Scottish Open in a supporting role, so to speak. 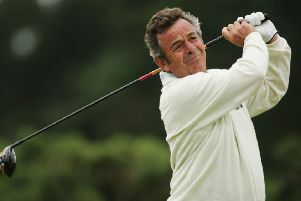 He is just pleased, though, that the home of golf has two players making their presence felt on a consistent basis on the game’s toughest circuit these days instead of sporadic forays in the past by the likes of Sandy Lyle and Colin Montgomerie. After a dip in form – it coincided with him becoming a father for the first time – Laird has been happier with his performances on the wraparound 2015 PGA Tour schedule. He chalked up three top 10s early on before receiving a timely boost for this trip when he ended up in a share of 15th in the Travelers Championship in his last outing. Of the 17 Scots in this week’s field, Warren has the best record in this event in recent years, having finished third in both 2012 and 2014. Reflecting on the first of those efforts, he admits that letting a three-shot lead with four to play had “hurt a lot” but, at the same time, had helped him feel “comfortable” when in contention heading into the final round at Royal Aberdeen 12 months ago. “I made mistakes at Castle Stuart but not last year and watching Justin Rose close out a tournament when leading helped me when I won again in the Made in Denmark tournament,” said Warren of his third European Tour triumph last August. • Today has been dubbed “Tartan Wednesday” at Gullane, with pro-am spectators being urged to join in the themed day.